Ahead of the European Film Market (where many projects emerge, only to never be heard from again), the fresh UK film sales outfit Embankment Films is preparing some new projects to represent. One such project is the adaptation of Animal Farm with Andy Serkis directing and doing motion capture work, but there are two new projects that we'd yet to hear about. One is Birdsong for Rise of the Planet of the Apes director Rupert Wyatt, and the other is a sci-fi film called Our Robot Overlords, which will mark the first sci-fi project for Gillian Anderson outside her iconic involvement with The X-Files on film and TV. Read on! 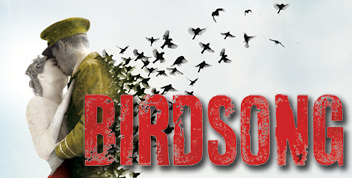 First, let's look at Birdsong, an adaptation of Sebastian Faulks’ acclaimed World War I novel of the same name. Wyatt is writing and directing after departing Dawn of the Planet of the Apes. The story spans three generations and the unimaginable gulf between the First World War and the present. As the young Englishman Stephen Wraysford passes through a tempestuous love affair with Isabelle Azaire in France and enters the dark, surreal world beneath the trenches of No Man's Land. BBC TV just had a recent adaptation of the novel, starring Eddie Redmayne (Les Miserables) and garnered six BAFTA nominations last year after being a hit on BBC One. We're not sure why this adaptation is happening so soon, but there you have it. So what's this Our Robot Overlords project? ScreenDaily says it's a modestly budgeted sci-fi film (around $21 million) that stars Gillian Anderson and Sir Ben Kingsley in a robot-occupied, futuristic Britain in which a gang of teenagers struggle to survive. Grabbers director Jon Wright will be at the helm, and Anderson says, "It’s a fantastic script set in the future about a woman who has four or five kids living with her in a world run by robots and they break out in search of the father who’s gone missing.” It sounds like Anderson and Kingsely will merely be supporting players, but the plot sounds pretty interesting, especially for a low budget film. Hopefully these films don't get lost in the shuffle at the European Film Market. Birdsong is a masterpiece novel and deserves to have a decent feature made out of it. The BBC version was far too light and did not show the horrors of WW1 and the flashback device resulted in the emotion being drained out of it between the leads. Read Fassbender was attached at one point to the film and he would be perfect casting.